Presented to Mosaic’s Julieta Pesce by Mary Wade of St Mark’s Catholic School, Stephanie Dean of GSK and Sally Smith of Hounslow Chamber (with Will Berryman of Rivers Academy, Nidhi Chhibba of Heston School and Jason Hermon of Lampton School). Mosaic are humbled at being the recipients of the Jubilee Cup at the 28th Spark! Annual Partnership Awards, an annual evening to recognise and reward active collaboration between education and the local business community in West London and surrounding areas. 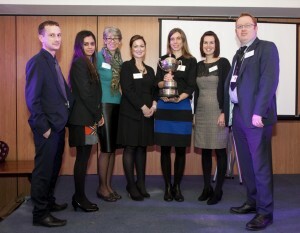 The Secondary School Cup, better known as the Jubilee Cup, acknowledges secondary schools’ and community partners’ excellence in work-related learning projects and is sponsored by GSK and the Hounslow Chamber of Commerce. Nominated by St Marks Roman Catholic School and supported by other local partners, Mosaic’s Enterprise Challenge Programme was highlighted as an excellent work-related learning project that students truly benefited from. The Enterprise Challenge, generously supported nationally by the Apax Foundation and Nectar Trust, and locally by the Heathrow Community Fund’s Inspiring Youth Programme, encourages young people to work as a team, develop their understanding of business and helps them improve their confidence, self-efficacy and employability. Working with volunteers mentors from a range of local companies that included GSK, Sky, Allianz and British Airways, teams of up to 5 students play an online business simulation game through which they maximise their online company’s profits. The top 5 profit-making teams in the region subsequently go onto regional finals, which in 2013/14 saw a team from Heston Community School from Hounslow make the cut. The winners from each regional final then go onto battle it out at the national grand finals, which in 2013 was won by St Bede’s Catholic Grammar School in Yorkshire. Upon receiving the award, Anu Atewologun, Mosaic’s London and South East Regional Manager commented: “We are truly delighted to receive this award. The best kind of recognition is always from the young people and schools we work with, so this is extra special for us. None of this however would be possible without our exceptional mentors, so we dedicate this award to them”. Mosaic’s Enterprise Challenge will be starting in January 2015 and it still isn’t too late to sign up as a mentor. Sign up today or please contact your local Regional Manager or mosaic@bitc.org.uk for more information.